In a previous post, I presented the Braided Turk's Head Lanyard. 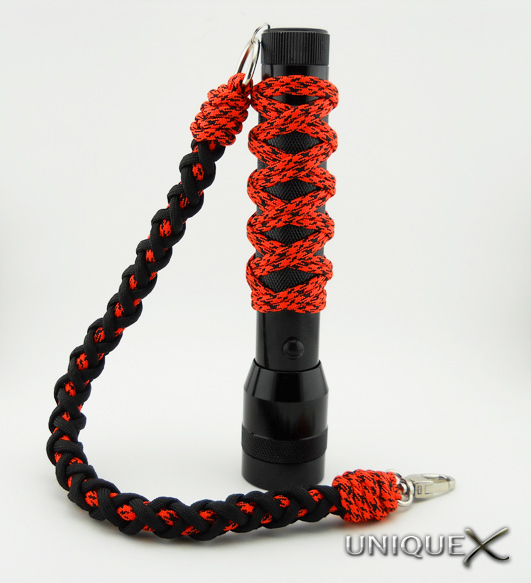 It was originally designed by Trident and creates a stylish lanyard, I added the lanyard to a Turk's Head-handled flashlight. This design shows the versatility of the Long Two Bight Turk's Head and has been a favorite of mine for a while. 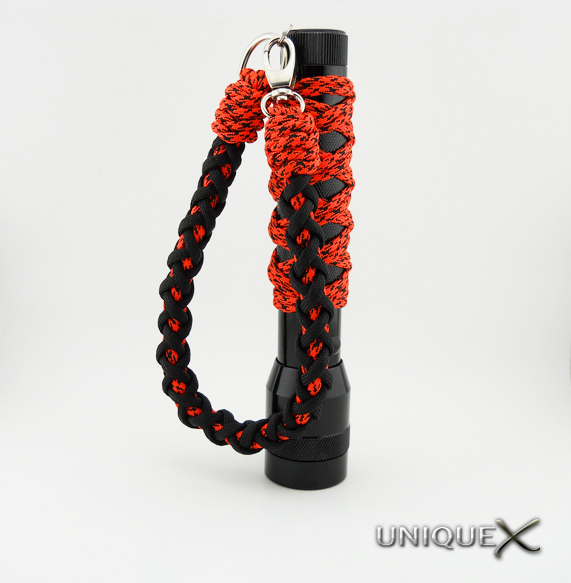 To create the lanyard for the flashlight, I used two four feet long strands of Tiger Camo paracord followed by twelve feet of Black paracord atop the braided strands. I don't remember the total length of cord used for the flashlight but somewhere around ten feet should be sufficient. To tie the lanyard, start by middling two strands which will leave you with four equal lengths. 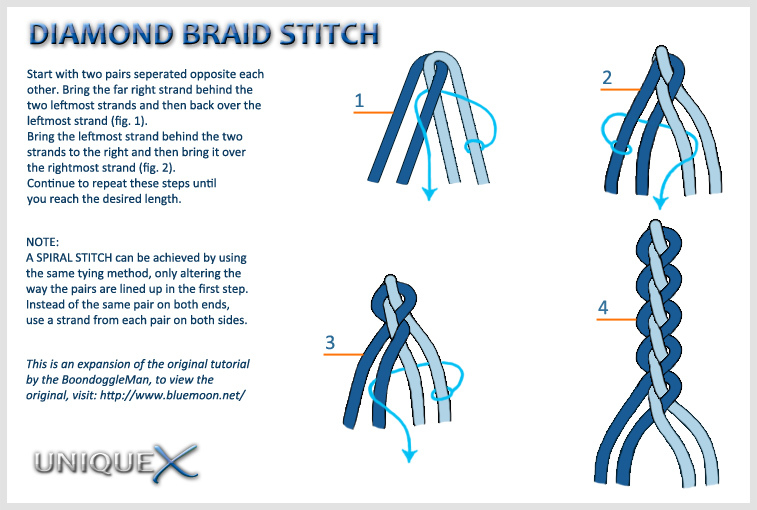 Start braiding by following my Diamond Braid Stitch tutorial and braid the entire length of cord to the ends. Complete the lanyard by tying a Long Two Bight Turk's Head atop the braiding. Use the first part of Bud Brewer's tutorial to tie the Long Two Bight Turk's Head. 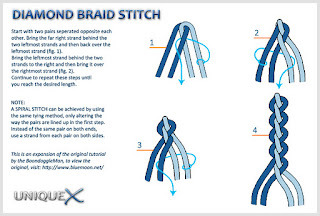 You will need to modify the tutorial to suit your needs, in the original tutorial, the first image shows three turns, you will need to keep going around the braiding until you have almost completely covered the braiding. Also, when making your initial turns over the braiding, for every turn you will need to skip two segments of braiding in order to make the end result look correct. I finished off the lanyard by attaching a 1/2" D-Ring and small lobster clamp by using West Country Whipping to cover the splice. The flashlight is straightforward if you have completed the lanyard, just tie a Long Two Bight Turk's Head and stretch the cord out to extend the opening. Make sure the end result is tightened so that no slippage will occur. Stay tuned, I intend to place my own spin on the Long Two Bight Turk's Head tutorial and hopefully it will be easier for those who haven't been able to figure it out yet. To secure the strands you will need to attach the four strands around a ring or whatever you are using for the end of the lanyard. You can do this many ways, but the easiest is to melt the ends together with a lighter to secure the paracord to the ring. Then cover the melted ends with what is called "whipping", I used West Country Whipping to cover the ends in this project.